On an unusually gloomy day I found myself hanging out in the Commodore lounge on board a Catalina Express ferry with my friend Jacki. I promised her I would not continue to whine about the weather but that was a promise I soon broke. 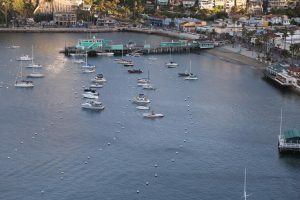 We were on our way to Avalon, the urban gem of Catalina Island. 22 miles from the mainland, in the ‘olden days’ this ride used take up to 4 hours to cross. On the Catalina Express ferry boat it took us only 60 minutes. From budget to luxury, there is a deal to fit every pocketbook and taste. Following is a sampling of winter offerings; a full listing can be found here. 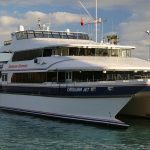 Each package includes round trip transportation on Catalina Express. 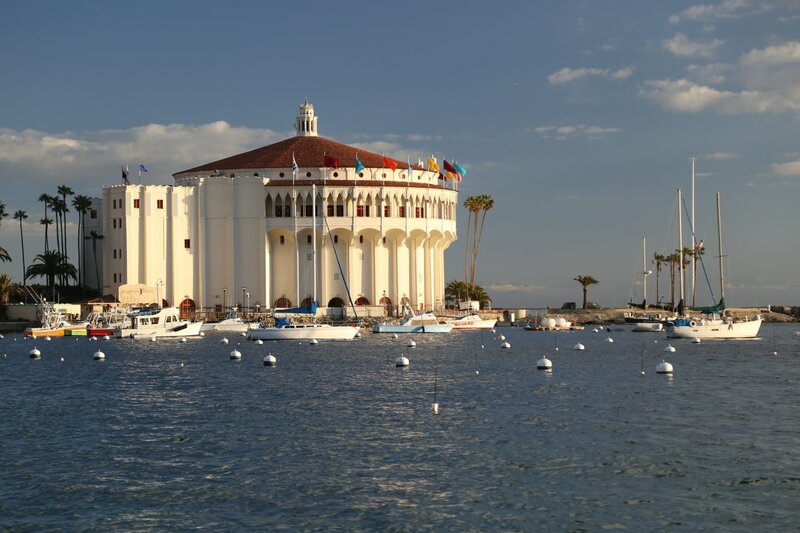 Pulling into Avalon reminds me of parts of the French Riviera I have visited – small towns near Nice and the country of Monaco. This is still Los Angeles County but feels far removed from the millions of people on the mainland and the 405 Freeway. With a population of around 3,500 residents it is sometimes hard to believe you are still in the same county as the city of Los Angeles. From the port it is a very short walk to the center of Avalon. Our destination was the appropriately named 100+ year old building that houses the Avalon Hotel. 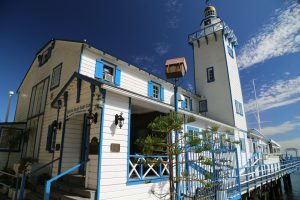 This is one of the island’s best boutique hotels. Very friendly staff, a rooftop deck, a serene garden courtyard, quiet rooms and good location provided for an enjoyable stay. Pre dinner drinks were at Luau Larry’s a local institution where one can find a number of 45oz cocktails. Oh and the Wiki Wacki – a tasty mix of rum, brandy, pineapple/orange juice and grenadine. People order this drink for the taste and the name but also for the straw hat which looks like it went through a weed wacker. Also, they serve up the best wings we had on the island. A post drink visit was in order to another bar – the Marlin Club – Avalon’s oldest bar (60+ years). Then it was on to Bluewater Avalon for some more drinking and some seafood. Oysters, swordfish, sand dabs – we did not hold back. Due to the nasty weather and very muddy roads in the interior of the island, our Cape Canyon Expedition was canceled. Not ones to sit idle for very long we soon reached out to Randy Lewis (not to be confused with the former race car turned Napa vintner of the same name). Randy owns BikeCatalina.com. He is a treasure trove of information about the island having been born and raised here. 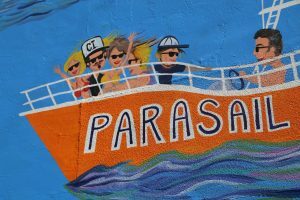 During our 45 minute ride to the Airport in the Sky we frequently stopped to discuss the island’s history, Hollywood’s influence and various natural attractions. 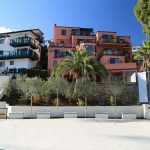 With limited flat space on the island, people got creative. Two mountain tops were leveled and then the resulting debris was pushed together to create a 3,000+ foot long level runway. Plane enthusiasts take note – a World War II era DC-3 still makes the run from Long Beach to this airport delivering mail and other goods for residents of the island. It was a real treat to see it take off. According to Randy who clearly had an appetite, the DC-3 Cafe serves up a hearty breakfast. He wasted no time in ordering. From the airport we said goodbye to Randy for a bit and rode our mountain bikes 10 miles back to Avalon – almost all downhill. Views of the interior, the ocean in the background and a few squirrels greeted us as we descended. It was a rare time to ride on these roads – after a number of years Catalina actually had some significant rain, much of which came in a storm a few days before we arrived. Creeks were flowing, the hills were green and the roads were muddy. 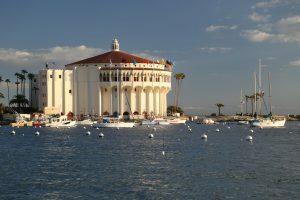 At some point (usually on arrival) every guest glances over at the iconic building sitting out on a point near Avalon. This is the casino – no, not that type of casino but rather the term in Italian means “a place of gathering”. 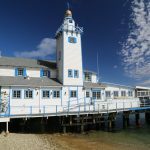 Built in 1929 it has hosted numerous events, concerts and films over the years. It is also home to the world’s largest circular ballroom. We took the Behind the Scenes tour, a rare opportunity to get up on stage, see the green rooms and access other rooms not open to the public. Our indefatigable guide Rebecca considered herself something of an opera singer and despite not feeling well, she would burst out into song at key points during the tour. Dinner that night was arguably the highlight meal of our stay – at the Avalon Grille. I’ve eaten here a few times before but in the two years since my last meal here, this restaurant has stepped up the quality of the cuisine. Delicious octopus and tuna tartar appetizers followed by more seafood! They also serve several ‘rare’ wines – a white and a red from Rusack, Santa Catalina Island Vineyards (the only vineyard and winery on the island). Thanks to J L’s Locker Room, our early evening turned into a late and epic night. 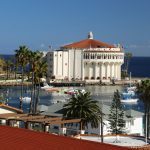 Appropriately named, this bar is housed in what used to be a former locker room for the Chicago Cubs when they used to hold their Spring Training on Catalina Island. One pear cider turned into two, then four, then people started buying us drinks and soon we were drinking shots of stronger stuff. The memories have faded since this evening – but I do remember some badly played pool, some ill advised rounds of darts and stumbling out the next morning sideways. We changed hotels in the morning (actually it was a late morning after the previous night) – one street over to another boutique gem, the Aurora Hotel. Modern rooms, a very nice rooftop with lounge chairs and views greeted us as we checked in. 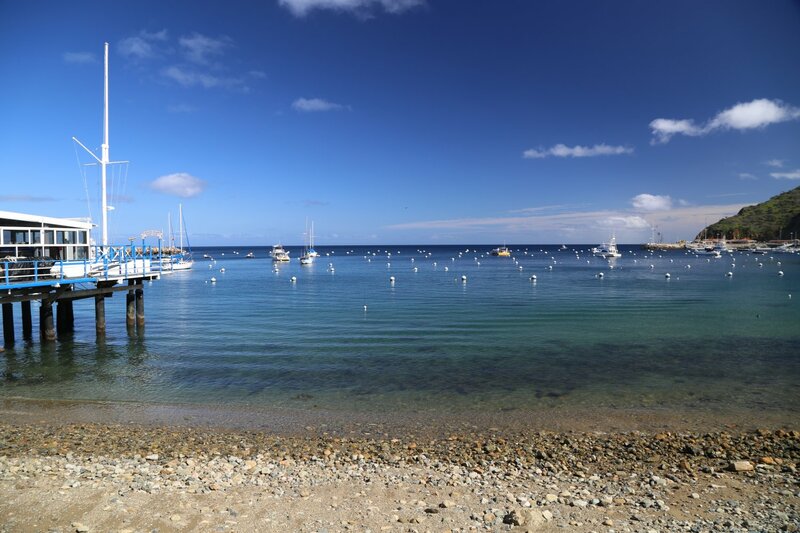 The weather had returned to ‘Catalina Normal’, clear skies with sparkling views. We headed over to one of my favorite parts of the island, the close-to-Avalon, but yet secluded Descanso Beach Club for lunch. Jacki decided some sobriety was in order but I was unable to contain myself and ordered a tropical island rum punch. With palm trees in the background, clear skies and sand, we could have been on some Caribbean Island. Seafood was the theme of our trip – clam chowder and prickly pear marinated shrimp salad satiated our appetites. 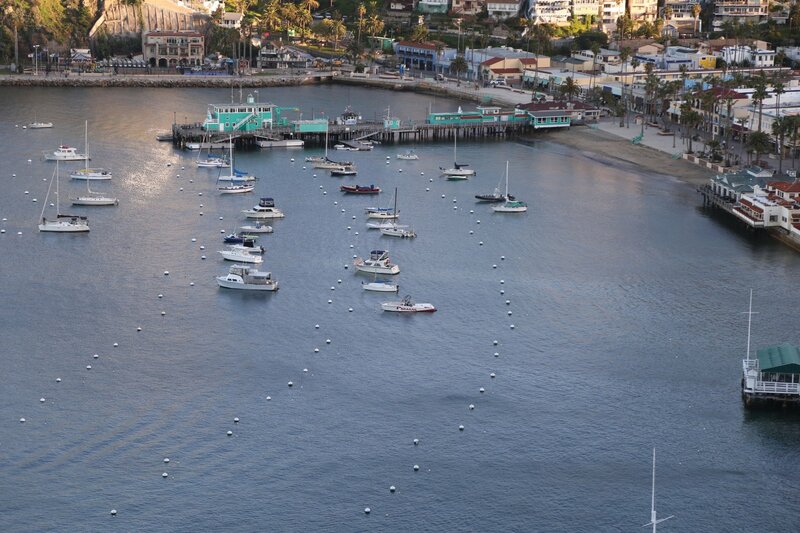 Don’t want to get wet but still experience the diversity of marine life in the waters surrounding Catalina? We sure didn’t want to get wet considering the bracing cold temperatures both in water and above – so we opted for a glass bottom boat tour. 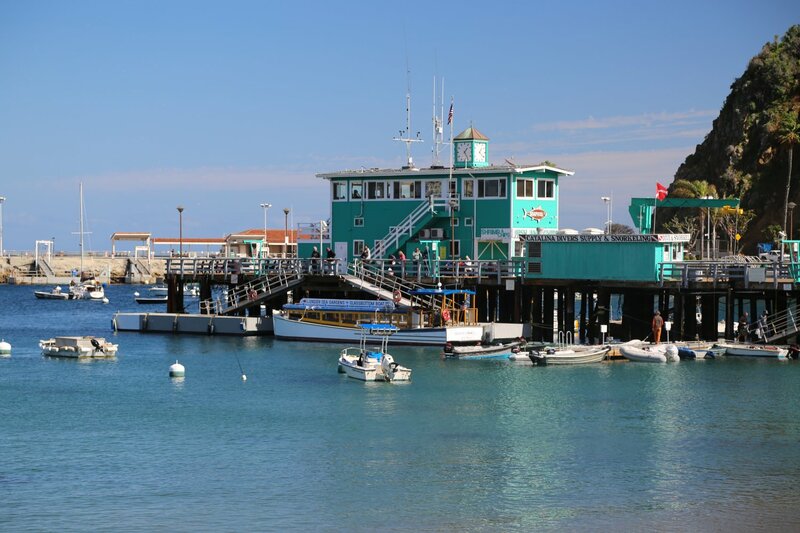 When you want to meet someone somewhere in Avalon just tell them the Green Pier. This landmark is where we met our Captain and soon situated ourselves above the glass ‘windows’ in the bottom of the boat. Lover’s Cove was our destination – apparently a place for couples to enjoy romantic interludes. For us it was a place to witness the incredible diversity of underwater life – we were serenaded by schools of fish including the orange Garibalidi. In the mood for some ice cream despite the arctic chill in the air I was denied my craving at several parlors due to the fact it was Wednesday which was clearly the day off for a number of businesses. Finding one open parlor I fixated upon the cotton candy flavor. Despite the flavor being an ice cream, it brought back faded childhood memories of summertime with family at county fairs. 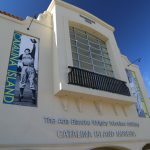 The largest public construction works project since the casino was built in 1929 is the new Catalina Island Museum. Highly recommended for any visitor to the island. Do not miss this gem. See the original ukulele that the song 26 Miles was recorded on, read about Hollywood’s influence on the island including Natalie Wood’s untimely death, see Catalina Pottery and view non Catalina Island artworks in their ‘rotating’ art galleries. A few people on Twitter mentioned you must go to the Lobster Trap for more seafood. So we did. Upon arriving we saw a line out the door (when all other restaurants were clearly empty). A good sign. After being seated it was more seafood – seafood linguine, raw oysters and more fish. The next morning dawned bright and clear. We were sad because we had to leave this lovely island’s calm embrace. We will certainly be back. Very good article, Dave. 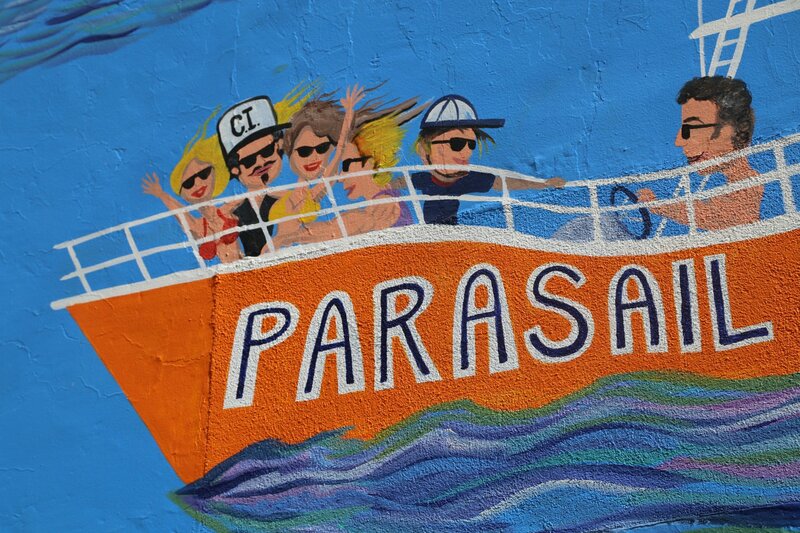 We enjoyed it a lot – along with your great photos. We’ll pass it on to our family and friends in Los Angeles and San Diego. Thanks Michael – its a picturesque spot with great weather almost all year – it is an island I can never get enough of! If I was to live on an island, it would be Catalina, with easy access to the mainland and all that comes from and can be enjoyed in the beautiful city of Los Angeles.